Once you have created your form and added fields, you can create a feed for eWAY. Feeds tell the add-on what to send to eWAY when someone submits a form. 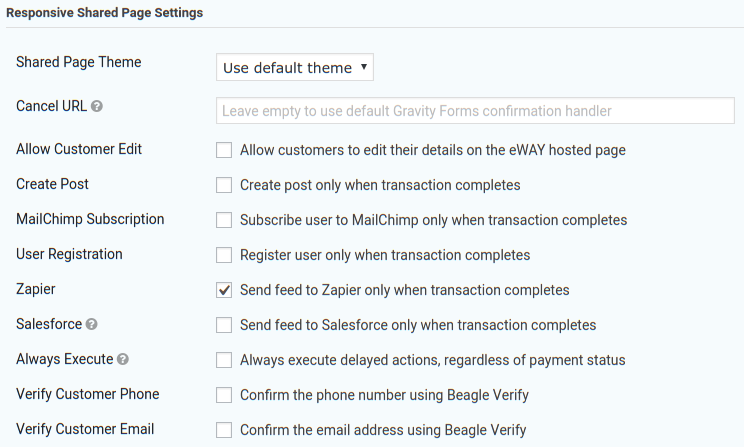 You create eWAY feeds under the Form Settings menu for the form. The first set of fields lets you select how your form sends information to eWAY. By default, it uses eWAY’s Responsive Shared Page, but you can change that here if you want Recurring Payments or a Direct Connection form. NB: you need to add a Credit Card field to your form if you use Recurring Payments or Direct Connection. Each field in the form that should be sent to eWAY needs a mapping. You can select the Gravity Forms field from a list of fields next to each eWAY field; see the example below. 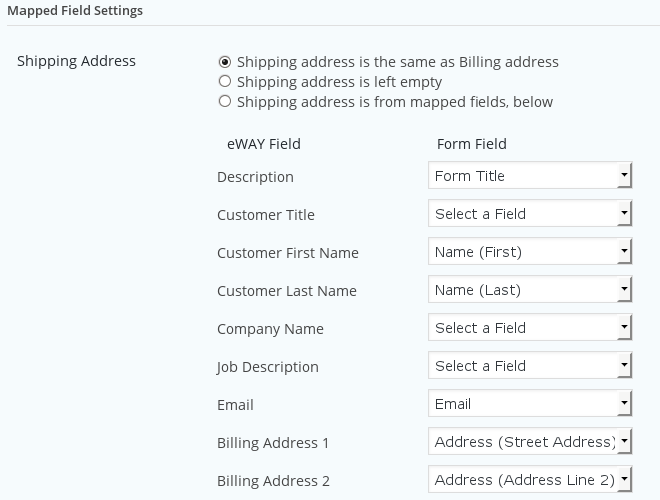 If you need to send shipping address fields to eWAY, you can either use the same fields as for the billing address, or select different fields from your form. When using the eWAY Responsive Shared Page, there are a few more settings. You can change the selected appearance of the shared page, and delay some Gravity Forms actions until after the customer returns from eWAY to your website. NB: these settings are only displayed for Responsive Shared Page feeds. NB: please also read the FAQ, Responsive Shared Page transactions still processing. A simple configuration change in your MYeWAY console can save you some head scratching! NB: you cannot have two eWAY feeds that both process a form. Only one feed will send a transaction to eWAY.